Official selection of the Woods Hole Film Festival. While this film could have easily turned into a simple history lecture on the art of whistling or perhaps a melodramatic rendering of a sporting event, Davis and Heilbroner have wisely made this film about people whose passion is whistling. “Pucker Up,” is the aptly named documentary about a small but engaging world of champion whistlers who compete in the Louisburg, North Carolina International whistling competition. In the wake of 9/11, filmmakers Kate Davis and David Heilbroner, known for more politically motivated subjects for their films, went for a decidedly less serious and purposely more joyous topic for their most recent creative outing. This one-year project follows the lives of various whistlers as they discuss their craft and prepare for the upcoming competition. 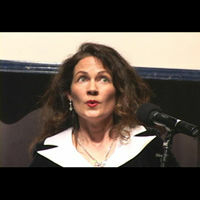 Shot with two cameras and a reliance on additional clips from both novices at the competition and various featured movie clips of famous whistlers, like Al Jolson in “The Jazz Singer” or Audrey Hepburn’s hailing of a taxi in “Breakfast at Tiffany’s,” Davis and Heilbroner have crafted the perfect film for whistling enthusiasts. Yet perhaps the ratings industry should craft a special category for this film and call it WOW: warning, only whistlers, please! If whistling is not your thing, then perhaps this is not the film for you. But then again, haven’t we all whistled at one time or another? According to the historical background that Davis and Heilbroner uncover in their film, whistling has not only been around forever, but it has also become an important part of our culture, too. Heck, even some of our American presidents have whistled extensively. Its heyday in the 1920’s to the 1940’s implies that this is a dying art, but those in present day Louisburg would clearly disagree. Their competition attracts whistlers from around the world. Like all competitions, both the competitors and judges are earnest and deadly serious about their skills. This competition draws from all walks of life and as Davis describes they have done a good job of “playing with the irony” that while whistling “can be art” it can also be “absurd.” Competitors range from novice New Jersey poultry guy Joe, to nerdy Carlyle executive and whistling champ Chris, to the Netherlands’s social worker who humorously admits that he even whistles at funerals! The film centers on these lovable characters’ stories, which all come together at the finals during the whistling competition. Tracking the lives of such unique but varied “characters” can be problematic on film, but Davis and Heilbroner’s careful editing expertly combines such diverse story lines together. They build the narrative by relying on interview segments from whistling experts and famous film clips to illustrate both the serious business that whistling has become and of the joy that it brings to the lives of these competitors. While at times the pacing is uneven, the film crescendos beautifully to the sought after night when only one can claim the title of the best whistler in the world. Pucker Up - official selection of the Woods Hole Film Festival. 1 comment(s) on this page. Add your own comment below.